The Deccan Plateau is a large plateau in southern India. It rises to 100 metres (330 ft) in the north, and to more than 1 kilometre (0.62 mi) in the south, forming a raised triangle within the downward-pointing triangle of the Indian subcontinent's coastline. The plateau is located between two mountain ranges, the Western Ghats and the Eastern Ghats, each of which rises from its respective nearby coastal plain, and almost converge at the southern tip of India. It is separated from the Gangetic plain to the north by the Satpura and Vindhya Ranges, which form its northern boundary. The Deccan produced some of the greatest dynasties in Indian history: the Cheras, Cholas, Pandyas and Pallavas, Satavahana, Vakataka, Chalukya, and Rashtrakuta dynasties; the Western Chalukya, Kakatiya Empire, Vijayanagara and Maratha empires; and the Muslim Bahmani Sultanate, Deccan Sultanate, and the Nizam of Hyderabad. 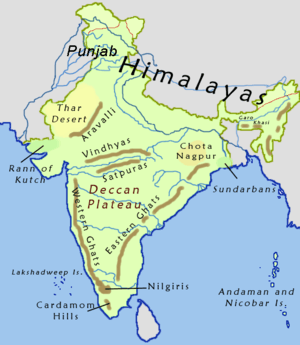 The name Deccan is an anglicised form of the Prakrit word dakkhin, itself derived from the Sanskrit word dákṣiṇa (meaning "southern"), as the Deccan Plateau is located in southern part of Indian subcontinent. The Deccan region has historically lacked an enduring geo-political centre, and has been defined in various ways. Geographers have attempted to define it using indices such as rainfall, vegetation, soil type or physical features. When considering physical features, it is taken to be the area bounded by the Narmada River, the Eastern Ghats and the Western Ghats. The 16th century historian Firishta defined Deccan as the territory inhabited by the native speakers of Kannada, Marathi, and Telugu languages. Richard M. Eaton (2005) also settled on this linguistic definition. Topographic Map of the Deccan plateau showing the locations of Major cities and Towns. The climate of the region varies from semi-arid in the north to tropical in most of the region with distinct wet and dry seasons. Rain falls during the monsoon season from about June to October. March to June can be very dry and hot, with temperatures regularly exceeding 40 °C. The Deccan plateau is a topographically variegated region located south of the Gangetic plains-the portion lying between the Arabian Sea and the Bay of Bengal-and includes a substantial area to the north of the Satpura Range, which has popularly been regarded as the divide between northern India and the Deccan. The name derives from the Sanskrit daksina ("south"). The plateau is bounded on the east and west by the Ghats, while its northern extremity is the Vindhya Range. The Deccan's average elevation is about 2,000 feet (600 m), sloping generally eastward; its principal rivers, the Godavari, Krishna, and Cauvery, flow from the Western Ghats eastward to the Bay of Bengal. The plateau's climate is drier than that on the coasts and is arid in places. Although sometimes used to mean all of India south of the Narmada River, the word Deccan relates more specifically to that area of rich volcanic soils and lava-covered plateaus in the northern part of the peninsula between the Narmada and Krishna rivers. 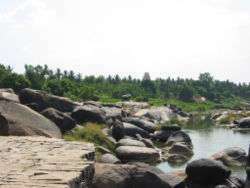 The eastern Deccan plateau, called Telangana, is made of vast sheets of massive granite rock, which effectively traps rainwater. Under the thin surface layer of soil is the impervious gray granite bedrock. It rains here only during some months. The northwestern part of the plateau is made up of lava flows or igneous rocks known as the Deccan Traps. The rocks are spread over the whole of Maharashtra and parts of Gujarat and Madhya Pradesh, thereby making it one of the largest volcanic provinces in the world. It consists of more than 2,000 metres (6,600 ft) of flat-lying basalt lava flows and covers an area of nearly 500,000 square kilometres (190,000 sq mi) in west-central India. Estimates of the original area covered by the lava flows are as high as 1,500,000 square kilometres (580,000 sq mi). The volume of basalt is estimated to be 511,000 cubic km. The thick dark soil (called regur) found here is suitable for cotton cultivation. 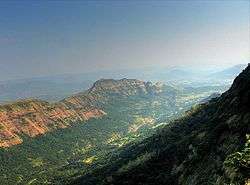 The volcanic basalt beds of the Deccan were laid down in the massive Deccan Traps eruption, which occurred towards the end of the Cretaceous period between 67 and 66 million years ago. Some paleontologists speculate that this eruption may have accelerated the extinction of the dinosaurs. Layer after layer was formed by the volcanic activity that lasted many thousands of years, and when the volcanoes became extinct, they left a region of highlands with typically vast stretches of flat areas on top like a table.The volcanic hotspot that produced the Deccan traps is hypothesized to lie under the present day island of Réunion in the Indian Ocean. The Deccan is home to many languages and people. Bhil and Gond people live in the hills along the northern and northeastern edges of the plateau, and speak various languages that belong to both the Indo-European and Dravidian families of languages. Marathi, an Indo-Aryan language, is the main language of the north-western Deccan in the state of Maharashtra. Speakers of Telugu and Kannada, the predominant languages of Telangana, Andhra Pradesh and Karnataka respectively, occupy those states' portions of the plateau. Tamil is the main language of Tamil Nadu to the south of the plateau, and Malayalam that of the hills and coast to the south-west, in the state of Kerala. The city of Hyderabad is an important center of Urdu language in the Deccan; its surrounding areas also host a notable population of Urdu speakers. The Urdu dialect spoken in this region is also known as Dakhini or as Deccani, named after the region itself. North of Andhra is the state of Odisha. People speak the language Oriya here. 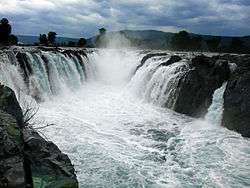 Apart from the states already mentioned, the state of Chhattisgarh is found in the northeast corner of the plateau. The four large cities in the Deccan are Chennai the capital of Tamil Nadu, Hyderabad the capital of Telangana, Bangalore the capital of Karnataka and Pune, the cultural hub of Maharashtra. 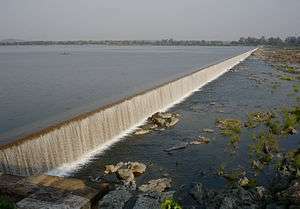 Other major cities include Mysore and Belgaum in Karnataka; Coimbatore, Madurai, Trichy, Salem, Erode, Tiruppur and Vellore in Tamil Nadu; Nagpur, Amravati, Kolhapur, Latur and Aurangabad in Maharashtra; Raipur in Chhattisgarh; Vijayawada, Visakhapatnam, Guntur, Kakinada, Eluru, Rajahmundry in Andhra Pradesh; and Warangal, Karimnagar, Nizamabad, Mahbubnagar in Telangana. The Deccan produced some of the most significant dynasties in Indian History like the Chola dynasty, Satavahana dynasty, Vakataka dynasty, Chalukya dynasty, Rashtrakuta dynasty, Western Chalukya Empire, Vijayanagara Empire and Maratha Empire. Of the early history, the main facts established are the growth of the Mauryan empire (300 BC) and after that the Deccan was ruled by the Satavahana dynasty which protected the Deccan against the Scythian invaders. Prominent dynasties of this time include the Cholas (3rd century BC to 12th century AD), Chalukyas (6th to 12th centuries), Rashtrakutas (753–982), Hoysalas (10th to 14th centuries), Kakatiya (1083 to 1323 AD) and Vijayanagara Empire (1336–1646). Ahir Kings once ruled over the Deccan. A cave inscription at Nasik refers to the reign of an Abhira prince named Ishwarsena, son of Shivadatta. After the collapse of the Satavahana dynasty the Deccan was ruled by the Vakataka dynasty from the 3rd century to 5th century. From the 6th to 8th century the Deccan was ruled by the Chalukya dynasty which produced great rulers like Pulakesi II who defeated the north India Emperor Harsha or Vikramaditya II whose general defeated the Arab invaders in the 8th century. From the 8th to 10th century the Rashtrakuta dynasty ruled this region. 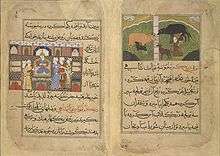 It led successful military campaigns into northern India and was described by Arab scholars as one of the four great empires of the world. In the 10th century the Western Chalukya Empire was established which produced scholars like the social reformer Basava, Vijñāneśvara, the mathematician Bhāskara II and Someshwara III who wrote the text Manasollasa. From the early 11th century to the 12th century the Deccan Plateau was dominated by the Western Chalukya Empire and the Chola dynasty. Several battles were fought between the Western Chalukya Empire and the Chola dynasty in the Deccan Plateau during the reigns of Raja Raja Chola I, Rajendra Chola I, Jayasimha II, Someshvara I and Vikramaditya VI and Kulothunga Chola I. In 1294, Alauddin Khilji, emperor of Delhi, invaded the Deccan, stormed Devagiri, and reduced the Yadava rajas of Maharashtra to the position of tributary princes (see Daulatabad), then proceeding southward to conquer the Telangana and Carnatic. In 1307, a fresh series of Muslim incursions led by Malik Kafur began in response to unpaid tributes, resulting in the final ruin of the Yadava power; and in 1338 the conquest of the Deccan was completed by Sultan Muhammad bin Tughluq. The imperial hegemony was brief, as soon Telingana and Karnataka reverted to their former masters. 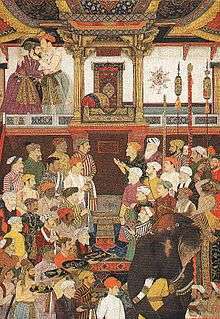 These defections by the Hindu states was soon followed by a general revolt of the Muslim governors, resulting in the establishment in 1347 of the independent Muslim dynasty of Bahmani. The power of the Delhi sultanate evaporated south of the Narmada River. The southern Deccan came under the rule of the famous Vijayanagara Empire which reached its zenith during the reign of Emperor Krishnadevaraya. In the power struggles which ensued, the Hindu kingdom of Telingana fell bit by bit to the Bahamani dynasty, who advanced their frontier to Golkonda in 1373, to Warangal in 1421, and to the Bay of Bengal in 1472. Krishnadevaraya of the Vijayanagara Empire defeated the last remnant of Bahmani Sultanate power after which the Bahmani Sultanate collapsed. When the Bahmani empire dissolved in 1518, its dominions were distributed into the five Muslim states of Golkonda, Bijapur, Ahmednagar, Bidar and Berar, giving rise to the Deccan sultanates. South of these, the Hindu state of Carnatic or Vijayanagar still survived; but this, too, was defeated, at the Battle of Talikota (1565) by a league of the Muslim powers. Berar had already been annexed by Ahmednagar in 1572, and Bidar was absorbed by Bijapur in 1619. Mughal interest in the Deccan also rose at this time; Ahmadnagar was partially incorporated in the Empire in 1598 and as fully in 1636, Bijapur in 1686, and Golkonda in 1688. In 1674, Shivaji laid the foundation of the Maratha Empire which within 75 years of his death covered territory of over 250 million acres (1 million km²) or one-third of the Indian sub-continent. Marathas under Shivaji directly challenged the foreign rule of the Bijapur Sultanate and ultimately the mighty Mughal empire. Once the Bijapur Sultanate stopped being a threat to the Maratha Empire, Marathas became much more aggressive and began to frequently raid Mughal territory. The Marathas had conquered part of central and western India by Shivaji's death in 1680. After Shivaji, Sambhaji defended the Maratha empire from the Mughal onslaught led by Aurangzeb. Marathas defeated Mughals in the prolonged war . After 1707, the Marathas acquired the right to levy tribute in southern India. After the death of Chhatrapati Shahu, the Peshwas became the de facto leaders of the Empire from 1749 to 1761, while Shivaji's successors continued as nominal rulers from their base in Satara. The Marathas kept the British at bay during the 18th century. By 1760, with the defeat of the Nizam in the Deccan, Maratha power had reached its zenith. However, dissension between the Peshwa and their sardars (army commanders) saw a gradual downfall of the Empire leading to its eventual annexation by the British East India Company in 1818 after the three Anglo-Maratha wars. A few years later, the Aurangzeb's viceroy in Ahmednagar, Nizam-ul-Mulk, established the seat of an independent government at Hyderabad in 1724. Mysore was ruled by Hyder Ali. During the contests for power which ensued from about the middle of the 18th century between the powers on the plateau, the French and British took opposite sides. After a brief course of triumph, the interests of France declined, and a new empire in India was established by the British. Mysore formed one of their earliest conquests in the Deccan. Tanjore and the Carnatic were soon annexed to their dominions, followed by the Peshwa territories in 1818. In British India, the plateau was largely divided between the presidencies of Bombay and Madras. The two largest native states at that time were Hyderabad and Mysore; many smaller states existed at the time, including Kolhapur, Sawantwari, Travancore, and Cochin. After independence in 1947, almost all native states were incorporated into the Republic of India. Hyderabad refused to join, and was annexed by the Indian Army in Operation Polo in 1948. In 1956, the States Reorganisation Act reorganized states along linguistic lines, leading to the states currently found on the plateau. Deccan plateau is very rich in minerals and precious stones. The plateau’s mineral wealth led many lowland rulers, including those of the Mauryan (4th–2nd century BCE) and Gupta (4th–6th century CE) dynasties, to fight over it. Major minerals found here includes, coal, iron ore, asbestos, chromite, mica, and kyanite. Since March 2011, large deposits of uranium, has been discovered in the Tummalapalle belt and in the Bhima basin at Gogi in Karnataka. The Tummalapalle belt uranium reserves promises to be one of the top 20 uranium reserves discovery of the world. Low rainfall made farming difficult until the introduction of irrigation. Currently, percentage area under cultivation is quite low, ranging from 60% in Maharastra to about 10% in Western Ghats. Except in areas of certain developed river valleys, double-cropping is rare. Rice is the predominant crop in high-rainfall areas and sorghum in low-rainfall areas. Other crops of significance includes cotton, tobacco, oilseeds, and sugar cane. Coffee, tea, coconuts, areca, pepper, rubber, cashew nuts, tapioca, and cardamom are widely grown on plantations in the Nilgiri Hills and on the western slopes of the Western Ghats. Cultivation of Jatropha have recently got more attention due to the Jatropha incentives in India. ↑ Page 46, Dr. Jadoan, Atar Singh (September 2001). Military Geography of South-East Asia. India: Anmol Publications Pvt. Ltd. pp. 270 pages. ISBN 81-261-1008-2. Retrieved 2008-06-08. 1 2 "The Deccan Peninsula". sanctuaryasia. Retrieved 2007-01-05. ↑ "The Deccan Plateau". rainwaterharvesting.org. Retrieved 2007-01-05. ↑ Henry Yule, A. C. Burnell. Hobson-Jobson: The Definitive Glossary of British India. Oxford. ISBN 9780191645839. ↑ Monier-Williams Sanskrit-English Dictionary, p. 498 (scanned image at SriPedia Initiative): Sanskrit dakṣiṇa meaning 'southern'. ↑ Richard M. Eaton 2005, p. 2. ↑ World Wildlife Fund (2001). "South Deccan Plateau dry deciduous forests". WildWorld Ecoregion Profile. National Geographic Society. Archived from the original on 2010-03-08. Retrieved 2007-01-05. ↑ "South Deccan Plateau dry deciduous forests". Terrestrial Ecoregions. World Wildlife Fund. Retrieved 2007-01-05. ↑ "Eastern Deccan Plateau Moist Forests". World Wildlife Fund. Retrieved 2007-01-05. 1 2 Marshall Cavendish Corporation (2008). India and Its Neighbors, Part 1, p. 335. Tarreytown, New York: Marshall Cavendish Corporation. ↑ Richard M. Eaton 2005, p. 83. ↑ Richard M. Eaton 2005, p. 88. ↑ Benichou, Lucien D. (2000). From Autocracy to Integration: Political Developments in Hyderabad State (1938—1948), p. 232. Chennai: Orient Longman Limited. ↑ Ottens, Berthold (1 January 2003). "Minerals of the Deccan Traps, India". HighBeam Research. Retrieved 8 August 2016. ↑ "Deccan Plateau, India". Encyclopaedia Britannica. Retrieved 8 August 2016. ↑ Subramanian, T. S. (20 March 2011). "Massive uranium deposits found in Andhra Pradesh". news. Chennai, India: The Hindu. Retrieved 8 August 2016. ↑ Thakur, Monami (19 July 2011). "Massive uranium deposits found in Andhra Pradesh". International Business Times. USA. ↑ Bedi, Rahul (19 July 2011). "Largest uranium reserves found in India". The Telegraph. New Delhi, India. ↑ "Peninsular India". ita. September 1995. Retrieved 8 August 2016. Richard M. Eaton (2005). A Social History of the Deccan, 1300-1761. Cambridge University Press. ISBN 9780521254847.